The first time I was confronted with the idea that descendants of Isaac are different, blessed and ultimately in conflict with descendants of Ishmael was when I was 15, at a youth conference in Haifa. The Christian hostel we were staying at had a number of pamphlets with various religious messages on them. The smallest of them was a small cartoon book that claimed to explain “The Origin of the Israeli-Palestinian Conflict”. The first page depicted a picture of a Palestinian suicide bomber, blowing himself up shouting “Allahu Akbar” as Israelis were running away. Outside of the frame of the picture was a young boy asking his dad “Why do they hate us?”. The rest of the booklet explained that there is only one reason why Israelis and Palestinians fight today, and this is because of the ancient brothers’ feud between Isaac and Ishmael. One brother is blessed and the other is cursed. One is the son of promise and pride while the other is wild and born out of shame. I then asked myself the following questions: Was I genetically wired to fight my Jewish neighbours and friends? Was there no choice in the matter? Am I predestined to be “a wild man”? Was I doomed to live in constant jealousy of the descendants of Isaac? Even at the age of 15 I realised this didn’t make any sense. Fast forward to 2017, and Isaac vs Ishmael has popped up again in both an old and a new way. Old, in the sense that it continues the main arguments and framework of Christian Zionist theology, and new in the sense that there is an additional twist. I recently attended an Arabic speaking youth and young adult conference which I had never attended before. The conference has over 130 young people and once I arrived I felt that there was a lot of excitement. The level of manipulation techniques used by the speakers were overwhelming. From light cues to emotional hype, this group had it all. I was incredibly disturbed by everything I witnessed, as the messages and techniques were so aggressive in targeting the youth. Before and after the main speaker shared their message, many random youth were picked out of the crowd and declared that they were leaders of the future and that they would lead a generation that would speak and challenge Prime Ministers and the highest powers on earth. “You have a destiny! Your generation will conquer!” This is just one example out of the many I witnessed during this conference. In this period of time where young people lack guidance and a purpose, particularly in this context, I could see how tempting it would be for them to soak in these words and attempt to find a social and spiritual purpose for themselves. Especially as they are less aware and able to deal with the risks of following and believing these messages. Yoder began by telling us about a dream she had from God that very morning about a famous race horse that had a heart three times the size of a normal horse. This race horse had an Arabian grandfather, which apparently was somehow relevant to the 130 Arabs and all their hearts. I could feel the real message on its way and then it hit: “God’s destiny for you the Arab Christians is to be John the Baptist and to prepare the way and serve the Messianic Jews, who are like Jesus coming to the Land”. This is our prophetic destiny as sons of Ishmael. Never had I heard these biblical themes used in this way before. God had appointed us with the sole purpose of serving another race of people and going against that is going against God’s divine will and appointment. 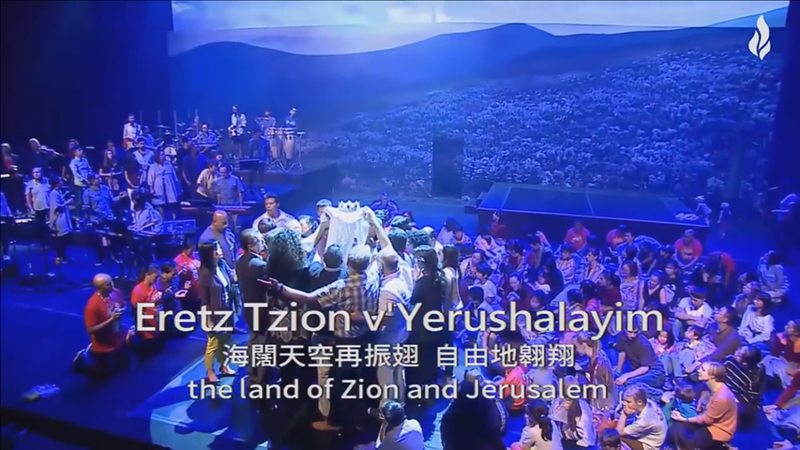 One shock followed another when suddenly a Messianic Jewish music band was summoned on stage and explained that they are here to teach the Arab participants worship songs in Hebrew. The next hour was filled with songs only in Hebrew and without any explanation of what they meant, even when the songs contained Zionist theology. Many of the participants did their best to sing along while others sat down looking confused, they were not warned beforehand nor did they understand what was going on. Some just stood with a glazed look, not sure what to do or how long this will go on. The above disturbing experience and the echoing message that God’s sole plan for me and my people was to serve and prepare the way, was stuck in my head for a while. I was concerned that this theology, which has clearly been imported, would take hold and influence the young people at the conference. The 822 Gathering is a series of conferences that take place all around the world under the Watchmen Family. As a movement it falls under the Charismatic category with so called prophecy and intercession at the heart of its activities. In 2016, the conference came to Jerusalem with the main theme of reconciling Isaac to Ishmael. There were many participants from China and other East Asian countries, but very few locals. When I heard about the theme, I decided to go through the recorded sessions to learn more. The conference claimed this was a historical and holy gathering of two brothers and that this was prophetically significant. Below are some highlights of how the new and false Isaac and Ishmael paradigm is being used today. In Session 2 of the conference, Isaac and Ishmael took a weird theatrical twist. The video has been removed and is no longer available, however I managed to take some screenshots and summarize some of the main points. The conference organizers claimed that this gathering will determine the harvest of who will be the sheep and who will be the goats and that this was the fulfilment of End Time theology and the fullness of the Gentile. 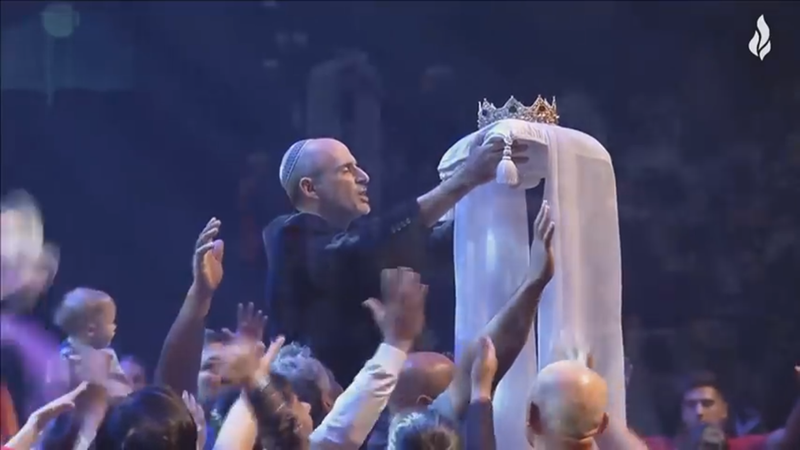 A Messianic Jewish pastor was hoisted up on two people’s shoulders carrying a crown. There was an eerie and disturbing feeling as he became the center of everyone’s attention. 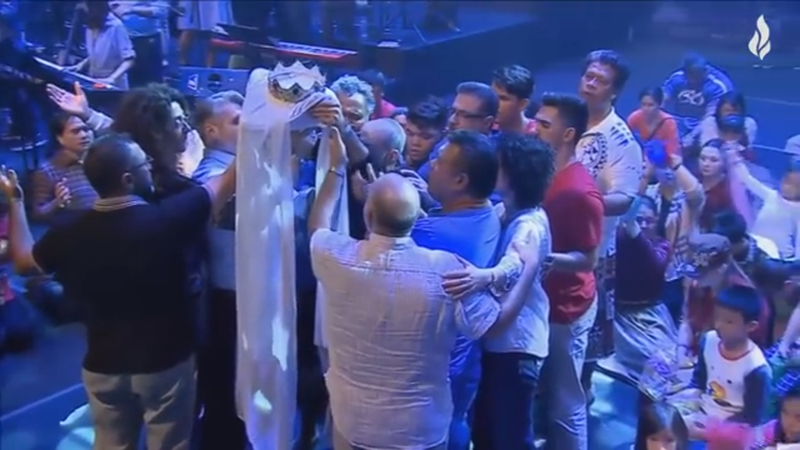 Soon after that, he was joined by some Arab Christian leaders who all helped hold his hands up. In the midst of all this the Israeli National Anthem begins playing and in total was played 3(!) times. David Demian, the main organizer of the conference, then came on stage and explained that “the crown is lifted by Jewish hands and they are supported and protected by Arabs”. In between the national anthem singing and flag waving, the hosts also focused on condemning the United Nations for making a controversial decision regarding the Temple Mount/Haram al-Sharif, claiming that it belongs only to the Jews. If the images above were not obvious enough, one can see a clear explanation for the different roles that Isaac and Ishmael take here. 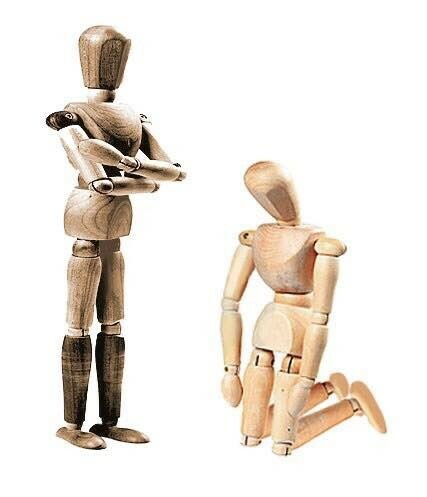 One is the chosen one with unique privilege while the other is a servant. This sentence neatly summarizes the change in attitude that many Christian Zionists have had regarding Arabs in general. Historically, Christian Zionists have viewed Arabs as inferior and as an obstacle to the Second coming of Christ. However with this new approach, Arabs (and specifically Arab Christians) are not exactly the wild and backward people that we are used to hearing about, but they have a role to play in serving another race of people to fulfil their destiny. This tantrum of a rant continued as an Arab Pastor from East Jerusalem stood up, representing the Arab leaders there, and made a ‘covenant’ with the Messianic Jewish Pastor regarding the status of the Temple Mount, declaring the UN as “tyrants” and rebuking their decision. One can also see here an old colonial trick of using a ‘native’ to justify and validate the power structure and legitimize the group in power’s position. In the past this was often used to maintain governance powers and a political status quo, thus reducing the chance of a resistance. Here one can see how it is being used to legitimize a certain religious/political stance and to solidify the racial and spiritual difference between to the two groups. The rhetoric continued throughout the sessions, with the Arab and Jewish participants being shepherded on and off the stage on a regular basis, like some kind of show-animal on display. I spoke to one of the Arab participants after watching the video and asked them what they thought. The participant told me that they didn’t really understand what was going on, it was all in English and the only translation that was taking place was in Chinese. They explained how they got tired of being constantly asked to come on stage in front of everybody. This profession of servanthood on behalf of Arab Christians was not only insulting but quite a severe twisting of scriptures, not to mention drawing a parallel between being a servant and being a wife. Even the word here “servant” is the wrong one. The word intended here is slave. A pastor from the Galilee and the pastor whose wife declared the statement previously mentioned, both jumped in to declare a covenant and fulfil the Christian Arab’s destiny to the Jewish people (3:50:40-3:59:00). Essentially, this pastor and his wife made a covenant to cement the Arab Christians as the slaves of the Messianic Jews. During the last session one of the female Arab participants got on stage and explained that Chuck Pierce, one of the leaders and founds of the previously mentioned movement NAR, prophesied over them when he was here. He said there is a portal over them and made an End Time declaration. Initially, it was strange for me that he should be mentioned in this conference right at the end, but then it all made sense. This conference was the starting point for the experience I had one year later. The person who was in charge of the youth program has also had a ‘prophetic correspondence’ (as early as 2012) with Chuck Pierce over a “rising threat to Israel” and has preached at his church. Now it was clear how the NAR were also behind this bigger conference and were supporting a Christian Zionist agenda. In conclusion, one can see how there has been a massive Christian Zionist (international and some local) attempt to spread this new paradigm of Isaac and Ishmael throughout the Holy Land. Groups like NAR, The Gathering and other Christian Zionists are pushing a new narrative that attempts to subjugate the Christian Arabs rather than eliminate, drive them out or ignore them. During my Bachelor degree in Criminology and Sociology I studied the different characteristics of a cult and how they function. I am forced to conclude that both the youth event I attended and the larger conference displayed the main elements of a cult. I have never witnessed so many of the characteristics in one event and how aggressively they were being used, especially on the youth. The level of racism, supremacy and wild misinterpretation of Biblical scriptures should ring alarm bells to all those that sincerely want to see both peace and justice between Israelis and Palestinians. The problem here lies in both the Christian Zionist use of a twisted theology and material influence, and for the Arab Christians the siding with such a power on the expenses of dignity and a theology that promotes real peace. While it is important to note that most Arab Christians do not subscribe to this, some do, some are taking advantage of the situation and others are being taken advantage of. Perhaps one of the more worrying issues here is the willingness of some Arab leaders to take on this slave/servant role and to spread it in their communities and especially with young people through the medium of manipulative and cultish techniques.